This Friday my friend Yis and I put together a last minute holiday show at the Mew Gallery (on Christian street in south Philly, right next to Sabrina's). 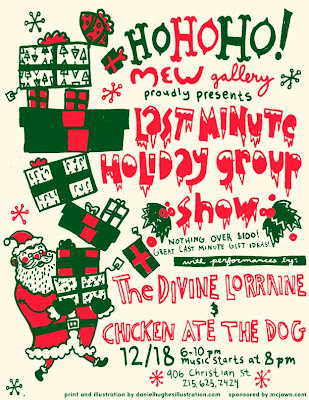 I got my friend Dan to draw and screen print the rad poster you see above, and my friends Chicken Ate the Dog and The Divine Lorraine are going to play some tunes. Oh yeah, and there is nothing over 100 bucks! Perfect for any last minute gifts that aren't going to break the bank. ummmm, I think Larry might have some stuff? It's gonna be a nice friendly get together with great art available for purchase and great music and stuff, hope to see you there.